There’s a special kind of joy you get from blessing someone who can’t do anything for you in return. We were created to give–it’s how our hearts are wired. We serve an incredibly generous God and when we give out of our joy we become more like Him. He entrusts us with gifts so we can discover the unspeakable joy that comes from giving as we shine His light to a broken and hurting world. Coach Madis and the Central High School tennis team spent the last few wee ks of November collecting over 60 gifts for our Christmas Compassion event, helping Milestone families in need this Christmas season. At Milestone, we’re an “everyone” church, and we really believe that no matter your age or experience, you can make an impact on those around you and live out the mission of Jesus every single day. 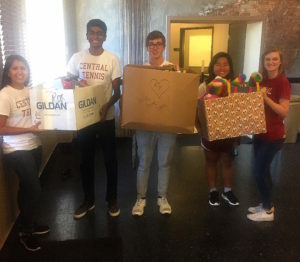 The Central High School tennis team is a great picture of what generosity in action looks like, and we love that they jumped in and served families in need! Our Christmas Compassion event is Friday December 9, and there are opportunities for you to serve. Or, you can donate to help us purchase the remaining toys and gift cards that we need. Experience like this is the best teacher for kids craving direction, guidance and clarity of the purpose. So excited to see how this one experience impacts their lives for God’s glory. Coach Madis is a huge blessing! Love that he makes an extra effort each year to teach students the importance of helping those less fortunate. Christmas Compassion was a huge success thanks to so many who gave and served!